Have you ever had a day when you feel like you are standing at the edge of a cliff, and might fall off? Well, I had such a day. You see, today I was confronted with a situation involving a titanic battle between Good Ross and Evil Ross. Good Ross wanted to do the right thing. Evil Ross wanted to do whatever was necessary to accomplish X goal. And the goal was INCREDIBLY alluring and intoxicating. INCREDIBLY. INCREDIBLY!!!!!!!!!!!! To Evil Ross, nothing mattered (not the truth or decency or fairness) but the objective. And the objective was considerable. It was all rather breathless, for, which Ross would win? Good or Evil? 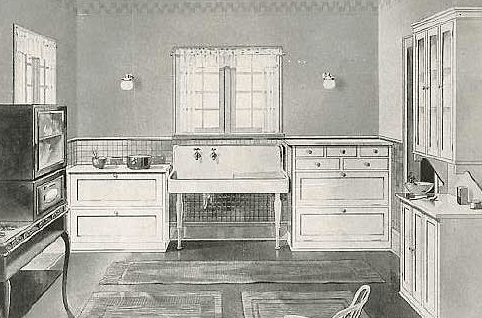 The image represents sorta kinda maybe likely what the 1921 kitchen of the carriage house looked like. The sink in the image is cast-iron, and with an enameled white finish. As I previously wrote, I would KILL for such a sink. KILL. As I also previously wrote, I am attempting to tie in various disparate components to create a wholly new kitchen on a $1.98 budget, but with the end effect intended to look appropriate to the carriage house, and — but of course, dahlin’ — look fabulous, too. And, oh, the end effect involves the color green. Today, I visited a neighbor. I will call my neighbor…Jane. When we walked into Jane’s kitchen I gasped. For, before me, was THE SINK. The sink as shown in the above image. But, but, but, the sink was (drum roll, please) green. Yes, green! Friggin’ green!!!!!!!! GREEN!!!!!!!! GREEN!!!!!!!! This is when Evil Ross suddenly rose from some dark unexpected place deep within my soul. And Evil Ross LUSTED after the green sink. Evil Ross was foaming at the mouth. Evil Ross was bug-eyed at the vision of the green sink in the carriage house. And Evil Ross could only think one thing: MUST…HAVE…GREEN…SINK. Good Ross however was appalled at such lust. Good Ross knew that the sink was original to the late 1930s kitchen of Jane’s home, and also knew without question that the sink should remain in place. Jane shrugged. Then she indicated, ever-so-slightly, like a wisp of indication, that she might actually tear out the green cast-iron sink. This was the moment when Evil Ross became all powerful. It was a terrifying moment, and surely a force recorded on a seismic scale. How could Good Ross withstand such a power? For, all Evil Ross could think was: MUST GET GREEN SINK! MUST GET! THE SINK IS GREEN!!!!!!!!!!!!!!!!!! I felt dizzy. Good Ross thought the green sink should remain in place. Of course. But Evil Ross WANTED THE SINK. Evil Ross cursed cursed cursed Good Ross. But Jane could not hear such profanity. Good Ross smiled (as he is wont to do), and departed, all the while Evil Ross wanted to smack Good Ross upside the head. Damn fool! Jane has great taste, and is an old house aficionado. She will keep the green sink. The reaction from Good Ross? Whoee!!!!!!!! The reaction from Evil Ross? Must somehow steal sink. I am sorry Ross, but this is THE funniest post you have ever written !! I know, I should not, but I kinda wanted the Evil Ross to get THAT GREEN SINK. Hey Ross, that sink was for sale here 2 months ago (ming/jadite green). Alas, not for a $1.98, but still… I searched everywhere for the listing, but it’s expired and gone. They can be reglazed in any color, but I’m dubious of that holding up in the kitchen. Too funny! You should have let evil Ross win. If nothing else, make sure you allow room for a green sink in the future. I will keep a watch out for you! At least if she changes her mind she knows of a home where her beloved sink will be cherished. Hilarious! I am still reading away after three days and that is the funniest one yet! I could just imagine your sink envy.